Imagine a school on the harbourside in a popular seaside town; a school surrounded by beautiful grounds with gardens, fruit trees, and space for recreation; a school with no more than 50 students, with a maximum of 10 students in a class, many nationalities, and with wi-fi, inside and outside. Then imagine a school with outstanding teachers, a unique activity programme, and a wide variety of course options. 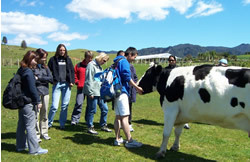 That’s Coromandel Outdoor Language Centre. We’re a big happy family. Please come and join us.